Regardless of what you celebrate, the last quarter of the year is filled with opportunities and traditions that focus on giving to others. To celebrate the season of giving, I thought I'd share some of my favourite ways to give back throughout the holiday season. Over the next few weeks, I'll be sharing different charities and initiatives I think are worth learning more about - starting with one of Nawal, Neve and my personal favourites: Operation Christmas Child. Nawal, Neve and I have been packing these shoeboxes for a few years now - after first hearing about them whilst living in England. Operation Christmas Child is an initiative by Samaritan's Purse which provides disadvantaged children around the world with a gift at Christmas time. For many of these children, this gift is the first one they will ever receive. For most of us, gifts at Christmas time are things we take for granted. It's something we've always received and just part of the tradition - but for so many people around the world, this isn't the case. Regardless of what you believe, I think any initiative that brings joy to children is one worth getting behind - and Operation Christmas Child does exactly that. 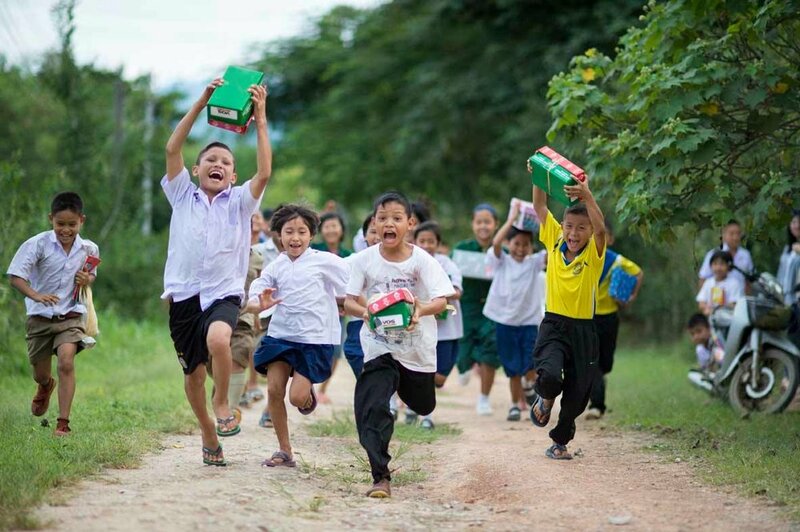 I still remember that feeling of excitement and hope I had when we received our shoeboxes. When the teachers gathered us together in our classroom and told us about the gifts we were super excited. I remember that my showbox had everything purple! I got a little doll, little notebook, a toothbrush, soap, colouring book, a letter and a picture of a family. I also received chopsticks, hairbands, a hairbrush, pencils and a little soft bear. It was awesome. The girls and I have opted to pack shoe boxes once again - and we thought we'd share what we packed in our boxes in case you're looking for ideas! A tshirt, a mini notebook, purse, colouring pencils, highlighters, toothbrush, fidget spinner, stamps, hair elastics and washi tape. In each box, you need to make sure you pack something to love, something to wear, something to play with, something for personal hygiene, something for school and something special. These don't have to be expensive or elaborate - and picking up items at a store like Kmart will mean each box will set you back only around $10-20. Something to LOVE: A teddy bear, doll or soft toy. Something to WEAR: A t-shirt, dress, a pair of sandals, a hat etc. (Our tip? Buy a clothing item that can be worn even if it's a little big. If you're shopping for a size 2-4 year old, buy a tshirt or tshirt dress in a size 4 so they can wear it for longer). Something to PLAY with: A fidget spinner, a bouncy ball, marbles, a skipping rope, a slinky, finger puppets, a harmonica etc. Something for PERSONAL HYGIENE: Note, you can't include things that may leak (our shampoo/conditioner and toothpaste had to be taken out!) so think of things like a toothbrush, face washer, hair brush, soap etc. Something for SCHOOL: Pens, pencils with a pencil sharpener, crayons, a notebook etc. Something SPECIAL: Sunglasses, bracelets, stickers, necklaces, craft kids, a note or photo from you and your family, a bag or purse etc.